The Joint Trail is located in the Needles District of Canyonlands National Park between Moab and Monticello, Utah. 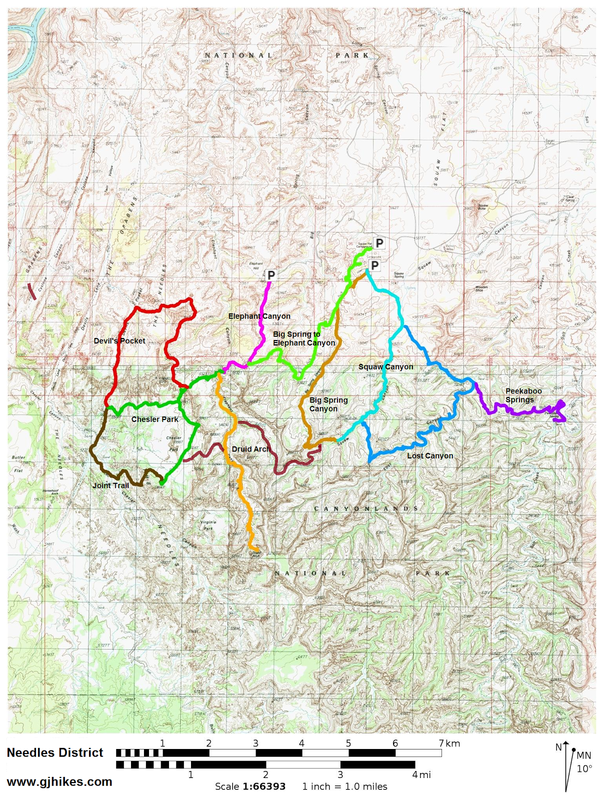 The Joint is a section of trail that passes through a deep, narrow gap in the rock on the south side of Chesler Park. Chesler Park an area that is like a sea of grass with spires of colorful sandstone rising from its midst and encircling its borders. The Needles District of Canyonlands is a hiker's delight with an array of trails leading to numerous hidden gems to explore that are guaranteed to leave you in awe of the parks natural beauty. The Elephant Hill trailhead is at the end of the gravel road west of the campgrounds. Before venturing too far away from the trailhead be sure to make the proper preparations by carrying plenty of water and trail snacks. The Needles District is a rugged area and many of the trails are primitive in construction. During the hot summer months the sandstone can soak up and radiate enough heat to raise the ambient temperature considerably so don't let a lack of water spoil your adventure. Follow the well worn trail from the trailhead. At about the 1 mile point of the hike the first good views of some of the needles open up before you. If someone visiting the Needles District for the first time wanted to get a good look at the needles and didn't have enough time for one of the longer hikes then the 1 mile hike to Elephant Hill would be the next best thing. After another half mile of easy hiking the first junction is met where the trail from the Squaw Flat campground joins in. From that junction the trail crosses a hill and passes through a smaller joint that is a taste of what waits ahead. The trail makes a bit of a scramble down some cliffs before reaching the wash in Elephant Canyon. After crossing the wash continue following the directions to Chesler Park. Two tenths of a mile before reaching Chesler Park the trail makes another split. The trail to the right leads to Devils Kitchen. 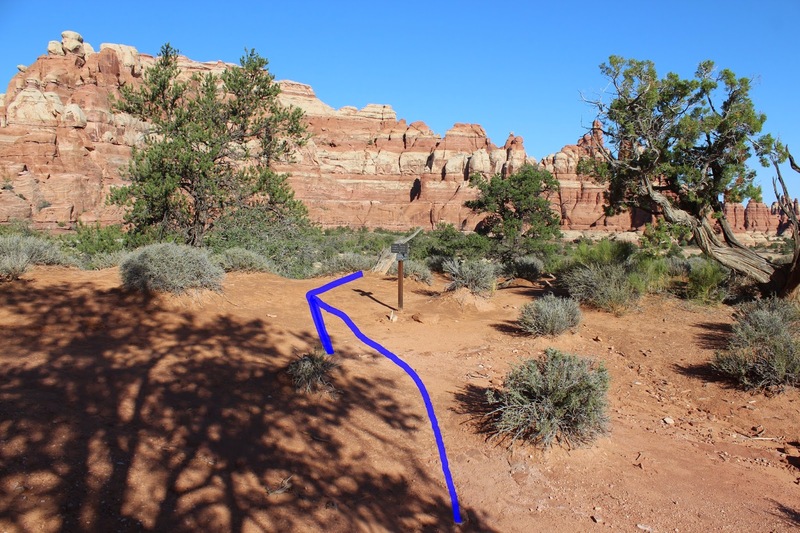 Follow the trail to the left that climbs over a small pass before dropping into Chesler Park. 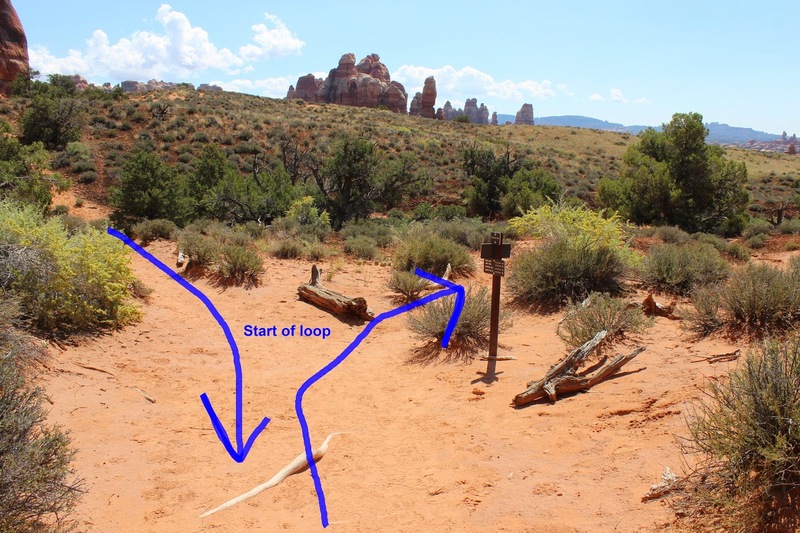 Chesler Park marks the beginning of the loop trail. The direction that you choose probably doesn't matter. On this trip we followed the loop to the right and came upon the Joint from the bottom. We have gone both directions but liked the views more going this way. Following the loop in this direction you are treated with some outstanding views of Chesler Park. The first part of this section of the trail is an easy jaunt. Eventually it reaches a few points that require a little bit of slickrock scrambling. The first spot has a few steps hewn into the rock to make it easier to manage. None of it seemed to require any technical skills and there didn't seem to be anything scary about any of it. At the next trail junction the sign is a little confusing as it points to the Joint Trail as being 3.2 miles behind you. The sign is referring to the upper end of the trail. Take the left fork toward the jeep road. The lower end of the Joint Trail is only about 1 mile away. From here the trail works its way down to the jeep road. The route from there is well marked with trail signs. When the jeep road splits take the left fork that leads to the lower end of the Joint Trail. 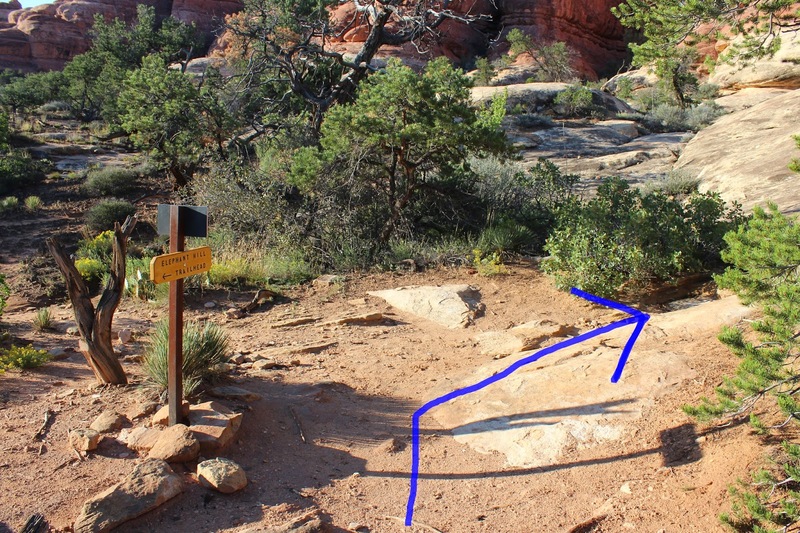 The sign at that spot is pointing you toward the Chesler Park trailhead which you can get to via the Joint. The right fork continues toward Beef Basin. The lower end of the Joint Trail begins with a snazzy little tunnel that opens up into a chamber. Look for a cairn on your left or just go left and pick up the trail from there. This is the part of the hike that everyone loves. Unless you are loaded down with packs and camera equipment like me there aren't really any squeeze points to worry about. Unlike most of Utah's slot canyons that were carved by water a joint occurs when the rock is stretched, or stressed, causing it to fracture. I imagine it as putting a thin layer of mud on a newspaper and then trying to lift it from below. It inevitably will crack and separate. Sure makes for a fun place to hike. There are two small rock falls or transition points to scramble over in the Joint. This one has a notched log as an aid and the other has several well placed stones. Here is a picture of some other hikers making quick work of both of them. Other than these two spots the Joint is pretty flat with a sandy bottom. The slideshow includes a couple of spots where we put the camera in movie mode to try and capture the essence of the Joint. Once out of the Joint follow the signs that lead back to Elephant Hill. The section of the hike heading back through Chesler Park is nothing short of outstanding. The scenery makes you feel like you are at a banquet table of all your favorite desserts where everything you see is a pleasing delight. The Park Service has a good map here to take along on the hike. We always seem to get to the Needles District before the Visitor Center is open so its nice to print out the map before hand. 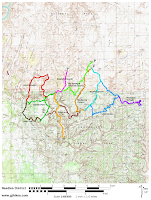 It can also be helpful to trace the route you are planning to take to make it stand out on the map from the other trails. Many visitors hike the trail as an out-and-back for a round trip distance of about 11.4 miles. Others hike the Chesler Park loop which comes out to be about 10.7 miles. In this case the longer distance might be slightly easier at the expense of seeing less of the Needles District. On our visit for this post we actually combined 3 hikes into one for a total distance of almost 17 miles. It made for a long day but it was an outstanding one. If you would like to see it for yourself then all you have to do is 'Take a hike'.